Our amazing beauty bundles are made up of two delicious smelling products. They are organic and have no nasty chemicals. Both products are made by B Organic skincare, an award winning company providing luxury, organic skincare. 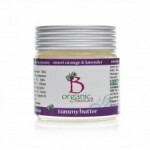 Tummy butter can be massaged into your baby bump and thighs, and the soothing body balm is one of B Organic’s most popular products, and will feed and nourish dry and damaged skin. Use the soothing body balm on your baby too, as it’s great for nappy rash and eczema.